What if I told you there was a cheap and easy way to significantly reduce the amount of work to do in your garden? Well, there is. It does require an investment in time to start with, but pays in the long term. So if you are a long game player, this can give you time to enjoy your garden rather than be a slave to it. Gardening here in the Thames Valley in even a modest garden will generate vast amounts of waste vegetative material. You could put in your fortnightly green bin collection, or put the majority of to work to – quite inexpensively – improving your own soil. What everyone needs is a compost heap. Time – or money – invested in the soil will bring returns through healthy, vigorous and longer lived plants. It does not have to cost anything. 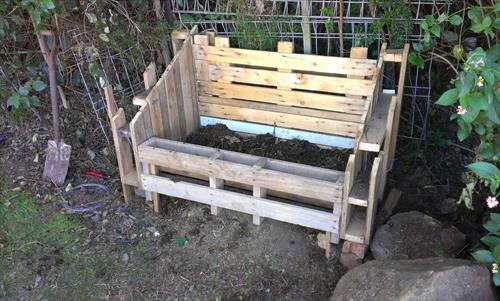 A few pallets will cost little, certainly not as much as a purpose made plastic “dalek” compost bin, and will be easier to use. I prefer to use a little time rather than spend money on compost. Its good exercise too, so no need to buy a gym membership! First an incentive. Eventually you’ll be able to forget about having to dig over beds to remove weeds and condition the soil; let nature do it for you. Creating compost is serving your garden a high energy meal, and the various insects that enjoy it will do all the hard work for you. A compost heap is not going to look pretty, so find somewhere discrete to keep it, even if that means building a screen to hide it. And all it has to do is contain the materials and hold them together so the beneficial bacteria that break down the plant matter can heat up and work effectively. No need to buy anything expensive mail order. Home composting is about recycling, and saving money. No need to buy something to look pretty. Key to success is allowing air and water into the compost heap. You could regularly turn the compost, allowing oxygen in and the materials to be mixed, but that can be hard work. Your container needs to retain heat and moisture, so the contents can degrade faster. So locating it in direct sunlight can help, though is not essential; mine are all in shaded areas and work fine, if a little more slowly. A balanced mixture of materials – soft grass and thicker woodier materials – will make it work better and faster. Adding cardboard or paper to separate layers will also help. Having a large amount of grass without other items to let air in will result in a nasty smelly unusable mess. A low-maintenance heap has brown and green plant matter, plus some moisture to keep the good bacteria going. If you have a hedge mow the clippings, and also any fallen leaves, as they contribute to the brown matter. And any not cooked kitchen waste is equally welcome. Remember to only add materials in combination to keep a good moisture balance and create air pockets. Compost care. You’ll have seen on TV programmes how the gardeners have 4 or more cages which empty into each other and hence turn the compost. Back in reality we have no time or space or interest in that. But you can create your heap so that tumbling, turning or rolling it is easier. 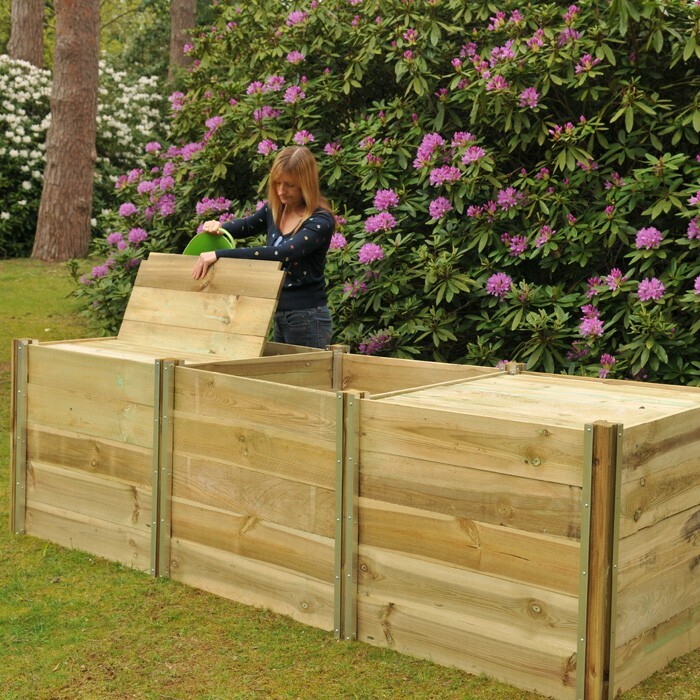 My article on the perfect compost bin is an example. Add material regularly to keep feeding the bacteria, and keep the pile covered to retain heat. Turn the heap as it rots down, best about once a fortnight, but at least every 4-6 weeks. Or just add the waste well mixed. Or build an easy to manage heap, as I have experimented with .And keep it damp; dry compost won’t rot down. You want to create something that looks and smells a little like potting compost you’d buy. Most important is that the right balance of mixed materials allows for air and water penetration. The better that mixture is, the less requirement there is to turn the heap. Make the heap as big as you can manage, in terms of managing but also in terms of what it will produce. Compost will need a certain amount of mass before it can get going, so don’t skimp. Keep the heap moist. It should feel damp to the touch, like a wrung out cloth.. Always combine different materials, even if its just grass and cardboard with a few kitchen scraps. Don’t put in the invasive and difficult weeds or their seeds, they are better in the regular waste collection. The science is simple, and natural. Add materials that will rot when exposed to air and water, mix occasionally and out comes the elixir that makes your garden grow. In my garden in Bourne End I have a soil that is heavy with clay. It retains moisture, and so many things rot over winter. In the summer it’s impenetrable, like rock. The gradual addition of compost has made the soil a crumbly easy to work texture that allows plants to expand their roots and flourish. Water drains away freely, but enough is retained. It has solved gardening paradox No 1 for me: well drained moisture retentive. I used to get frustrated about how one could find this utopia, but the compost heap has supplied it. And there are other benefits, in addition to the £300 or more that I don’t have to spend on the same volume of bought in compost to put on my beds. Some old pallets for a few pounds each will do just as well, and let you make a heap as you want it. Soil structure is improved, retaining moisture in sandy soils and allowing drainage in sticky or clay soils. Having an open structure prevents the surface from sealing or crusting. Water can penetrate, where a crusted surface just sees water drain off and away from the plants. An open soil will not compact so easily, which is better for the plants to get roots into, and insects to carry on their livelihoods, working the compost into the soil for you. Depending on what you put into the compost, it can neutralise your soil PH, making it more suitable for more plants. And it saves you having to buy material to make your garden grow. Just spread it on twice a year and let nature do it for you. The more you do it, the better the garden is for it, and the easier it becomes to work it. And the garden will also generate more materials to go into the compost heap. And the circle is complete. So if you want to start one autumn may be the perfect time. You’ll have lots of waste to cut down and no room left in the green bin. Its easier and quicker than taking it to the dump, and it’ll save you a packet next year. After a couple of years you’ll have less hard digging to do, and less plants to throw away that have died through too much or not enough water. Win, win, win.